You can also take advantage of the Aweber 30-day free trial. Just enter your credit card number and set up your account. If you do nothing, you’ll get automatically billed every 30 days thereafter. 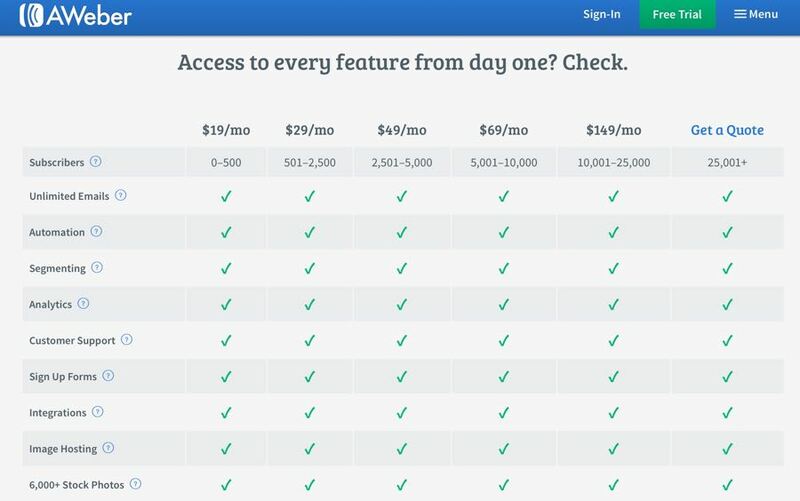 Or you can cancel within the first 30 days to avoid charges if you decide it’s not a good fit for your business. 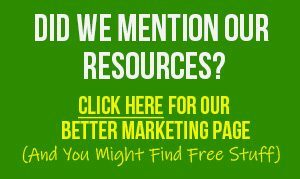 If you want to take advantage of the Aweber 30-day free trial just click the button below and you can find out if this solution is right for you. 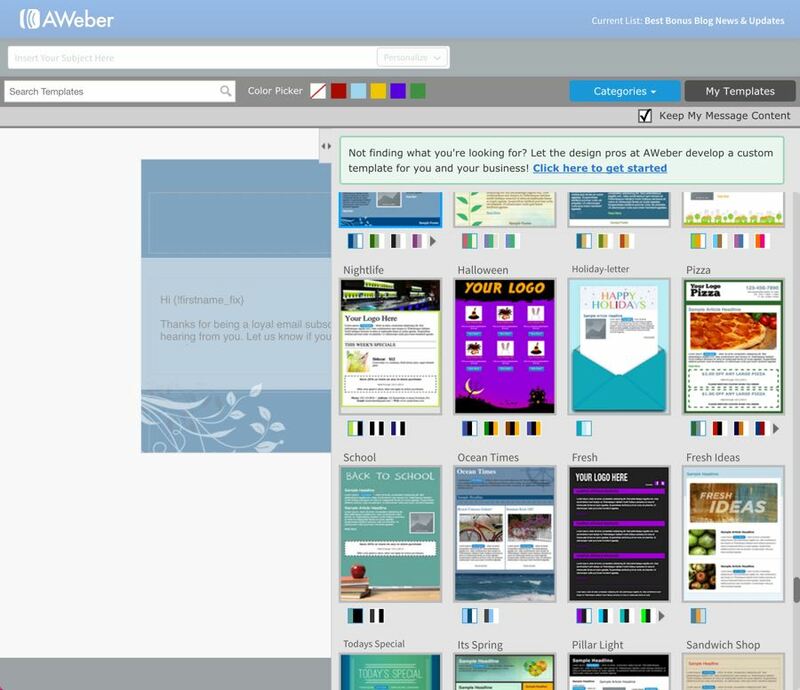 You get access to over 700 different Aweber email templates. Some of them are designed for specific events, such as a sale or even a holiday. Others are better suited to specific industries. The majority of them are professional designs that you can send at any time to any list. You’re sure to find something to suit your needs. Sign up form templates: Yes. Aweber lets you pick from hundreds of sign-up form templates which are suitable for a variety of industries and even particular events (such as holiday forms). These templates are click and point easy, so you don’t need to know any coding to swap out different colors, font styles and so on. Confirmation email sent regardless double opt-in or single opt-in: Yes. Platform: You can access it via mobile and web platforms. 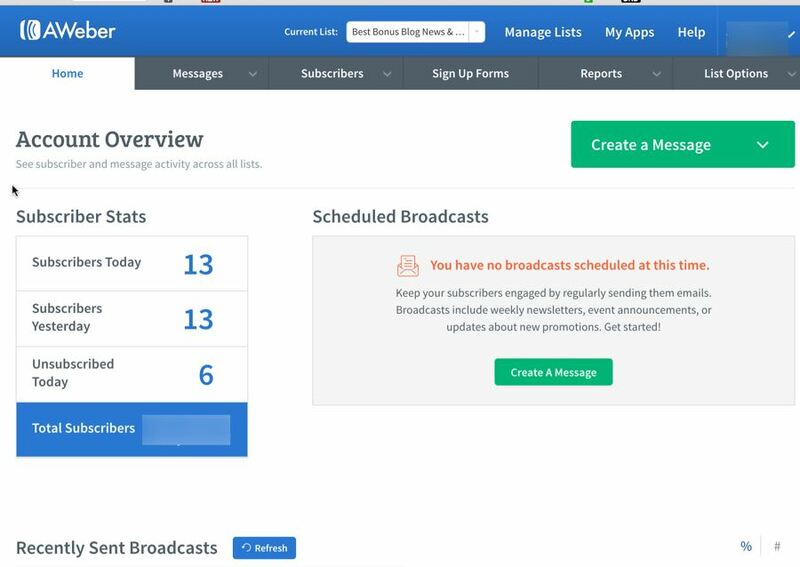 For starters, you can segment your Aweber list according to subscriber behavior. For example, you can segment according to who opens a particular email and/or who clicks on a specific link in a particular email. 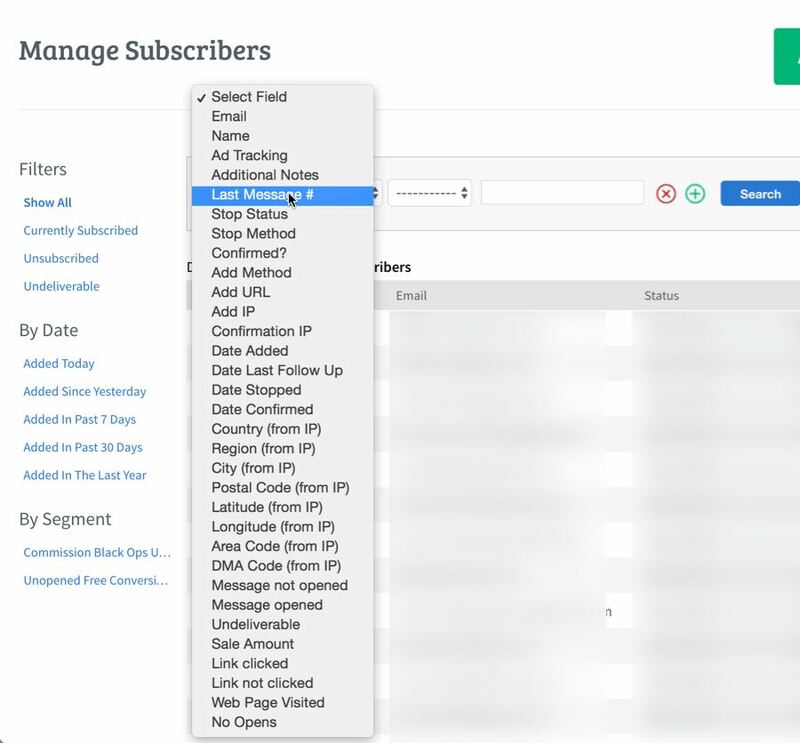 You can also segment your list according to the last message a subscriber opened, when they joined your list, where they are in your autoresponder sequence, and if they’ve opened your initial series emails and/or clicked on the links. You can also segment according to any information collected during the registration process, such as custom fields. Aweber also gives you the ability to segment by location (according to the subscriber’s IP at the time they joined your list). Yes, but limited. You can only create rules around subscriptions and unsubscriptions. Subscribe-on-subscribe. This means that if someone subscribes to one particular list, they’re automatically subscribed to another one of your lists. For example, perhaps someone joins one of your list segments as a result of signing up to a webinar. You can then automatically add them to your main list too. Subscribe-on-unsubscribe. The idea here is that if someone subscribes to one of your lists, they automatically get unsubscribed from another. For example, if you place someone on your customer list, then they’ll automatically get unsubscribed from your prospect list. Unsubscribe-on-unsubscribe. If someone unsubscribes to one of your lists, you can apply a rule that they’re unsubscribed from one or more of your other lists. Note that only one rule can be triggered at a time. You can use the AWtomator tool to start using the tagging feature. For example, you can automatically tag people after they finish an autoresponder sequence or after they click a link. You can then send messages to anyone who has been tagged. You can even trigger a campaign. 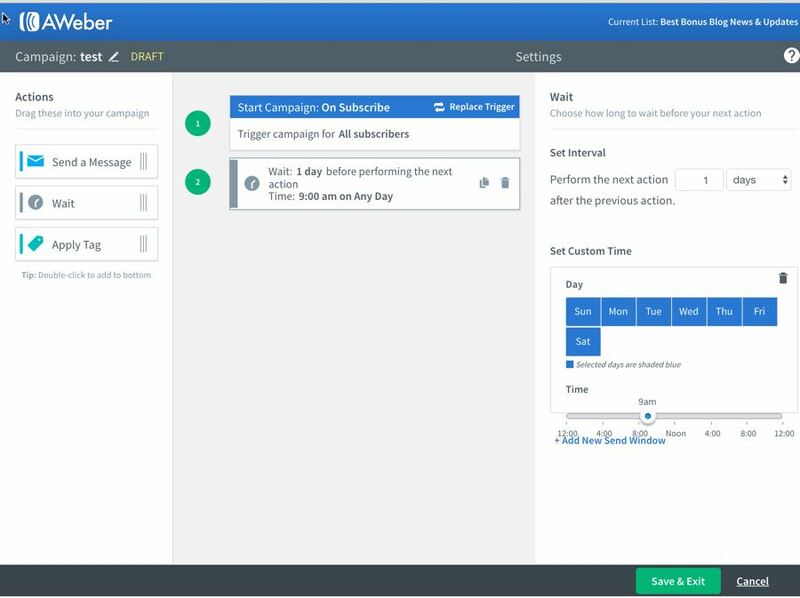 Aweber split testing include subject lines, content, templates, HTML vs plain text emails, links and even the sign-up form. Visual Campaign Building Tools: No. CRM: Yes. Aweber integrates with SalesForce. Aweber integrates with over 70 apps, including those related to social media, landing pages, shopping carts and more. 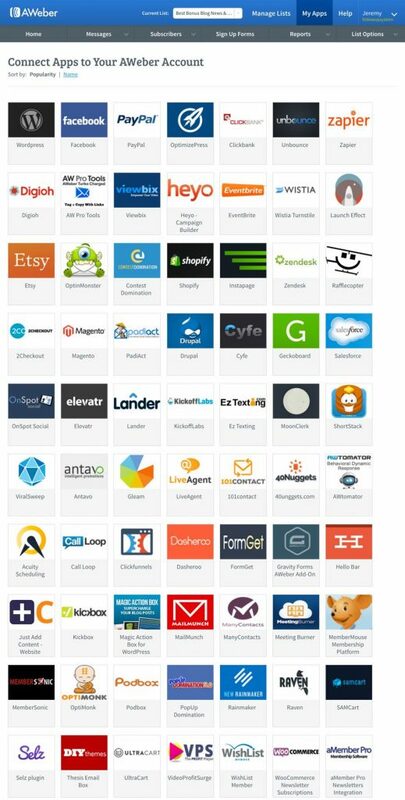 You’ll also find that it integrates with the most popular apps, including Zapier, Shopify, PayPal, WordPress, Facebook and many more. 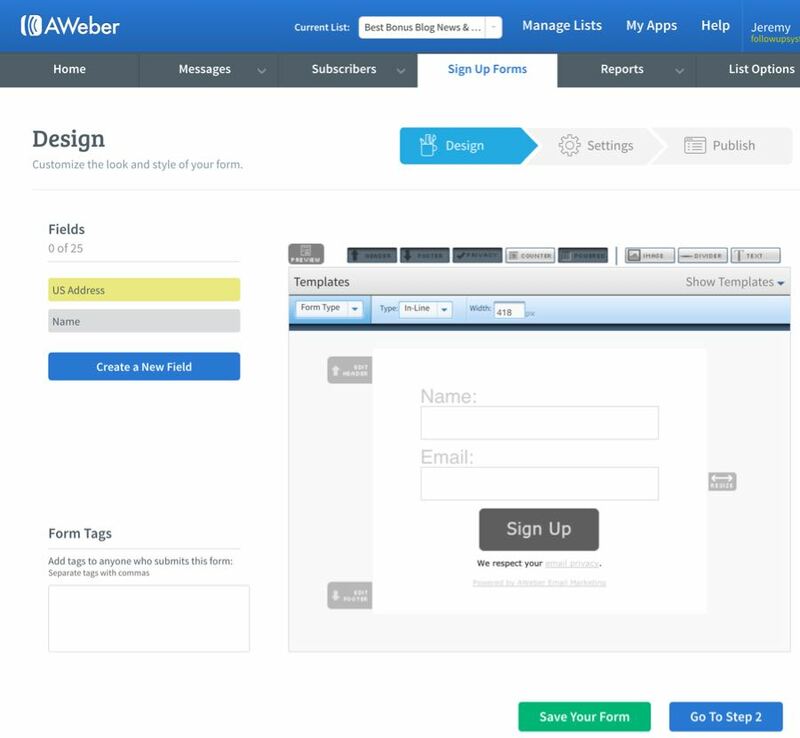 Aweber also provides a lot of documentation and help videos to get you started, so even beginners will be able to jump right in and start setting up autoresponders and opt-in forms. Aweber provides both help desk support as well as live chatting support. With live chatting you’ll get almost instant support, whereas with the help desk route you can generally expect a response within a few hours during normal business hours. Aweber deliverability is superb with a 98% deliverability rate, which is one of the highest in the industry. They have a very good reputation in this regard, and they’re constantly working hard to make sure your emails get to their intended recipients. Anyone can use. This includes affiliates, as Aweber is one of the few email service providers that’s friendly to affiliates. For years, Aweber has been heavily involved in the online marketing industry – answering questions on forums, being a visible part of business groups and so on. 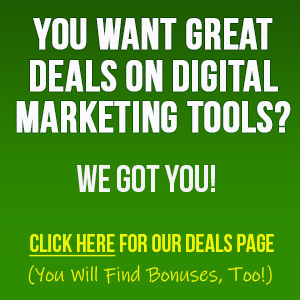 They have a vested interest in helping marketers succeed. Templates: lots of templates for both your newsletter and sign up form. Creating new forms is fast and easy with their three-step process. 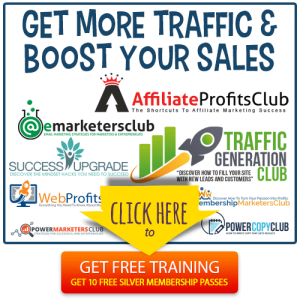 Aweber is one of the very few email services that are affiliate-marketing friendly. Aweber automation functions are lacking. 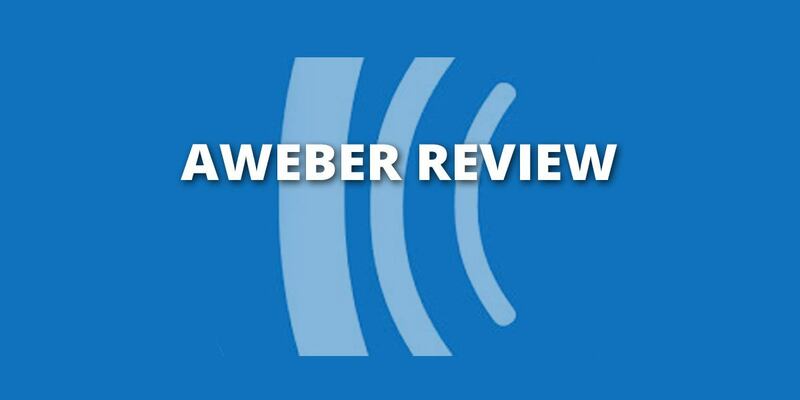 Overall, our impression and experiences show that Aweber is easy to use, they have a great reputation, and they’ve been around for a long time. We have quite a few subscribers with Aweber since this is one of the first autoresponders we started using. Since we’ve been with them for a long time, we’ve also noticed their delivery can be iffy at times. And remember… There is a free trial available, so if you want to take advantage of the Aweber 30-day free trial just click the button below and you can find out if this solution is right for you. See how Aweber stacks up against other email automation services we’ve fully tested and reviewed in our “Top 5 Email Marketing Software Compared & Reviewed” blog post.